The following inspiring story from the Harvard University Gazette shows how one man's vision transformed the lives of over six million people in Columbia's capital of Bogotá. In his 10-year tenure, Mayor Mockus focused on changing hearts and minds – not through preaching but through artistically creative strategies that employed the power of individual. He also spoke openly of his own failings, not suggesting that he was more moral than anyone else. May we all focus on creatively changing hearts and minds for the good of all with whom we share this world. Mockus recently came to Harvard for two weeks as a visiting fellow at the Kennedy School's Institute of Politics to share lessons about civic engagement with students and faculty. "We found Mayor Mockus' presentation intensely interesting," said Adams Professor Jane Mansbidge of the Kennedy School, who invited Mockus to speak in her "Democracy From Theory to Practice" class. "Our reading had focused on the standard material incentive-based systems for reducing corruption. He focused on changing hearts and minds - not through preaching but through artistically creative strategies that employed the power of individual and community disapproval." "He also spoke openly of his own failings, not suggesting that he was more moral than anyone else. He is a most engaging, almost pixieish math professor, not a stuffy 'mayor' at all. The students were enchanted, as was I." The slim, bearded, 51-year-old former mayor explained himself thus: "What really moves me to do things that other people consider original is my passion to teach." He has long been known for theatrical displays to gain people's attention and, then, to make them think. Mockus, the only son of a Lithuanian artist, burst onto the Colombian political scene in 1993 when, faced with a rowdy auditorium of the school of arts' students, he dropped his pants and mooned them to gain quiet. The gesture, he said at the time, should be understood "as a part of the resources which an artist can use." He resigned as rector, the top job of Colombian National University, and soon decided to run for mayor. 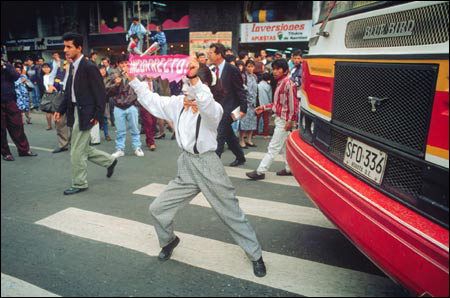 The fact that he was seen as an unusual leader gave the new mayor the opportunity to try extraordinary things, such as hiring 420 mimes to control traffic in Bogotá's chaotic and dangerous streets. He launched a "Night for Women" and asked the city's men to stay home in the evening and care for the children; 700,000 women went out on the first of three nights that Mockus dedicated to them. Most important to Mockus was his campaign about the importance and sacredness of life. "In a society where human life has lost value," he said, "there cannot be a higher priority than re-establishing respect for life as the main right and duty of citizens." Mockus sees the reduction of homicides from 80 per 100,000 inhabitants in 1993 to 22 per 100,000 inhabitants in 2003 as a major achievement, noting also that traffic fatalities dropped by more than half in the same time period, from an average of 1,300 per year to about 600. Contributing to this success was the mayor's inspired decision to paint stars on the spots where pedestrians (1,500 of them) had been killed in traffic accidents. "Saving a single life justifies the effort," Mockus said. There is almost always a civics lesson behind Mockus' antics. Florence Thomas, a feminist and a professor at Colombian National University, pointed out to Mockus that in Bogotá women were afraid to go out at night. "We were looking for what would be the best image of a safe city, and I realized that if you see streets with many women you feel safer," Mockus explained. So he asked men to stay home and suggested that both sexes should take advantage of the "Night for Women" to reflect on women's role in society. About 700,000 women went out, flocking to free, open-air concerts. They flooded into bars that offered women-only drink specials and strolled down a central boulevard that had been converted into a pedestrian zone. To avoid legal challenges, the mayor stated that the men's curfew was strictly voluntary. Men who simply couldn't bear to stay indoors during the six-hour restriction were asked to carry self-styled "safe conduct" passes. About 200,000 men went out that night, some of them angrily calling Mockus a "clown" in TV interviews. But most men graciously embraced Mockus' campaign. In the lower-middle-class neighborhood of San Cristobal, women marched through the streets to celebrate their night. When they saw a man staying at home, carrying a baby, or taking care of children, the women stopped and applauded. That night the police commander was a woman, and 1,500 women police were in charge of Bogotá's security.